In the early 15th century, France was in turmoil. The country had been at war for years, and it had no king. Out of the chaos came Joan of Arc. 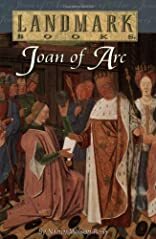 No one knows how Joan, a poor farm girl, was able to command armies and win battles, but she did all that and more. Some called Joan a heroine. Others called her a witch. But with her determination and unwavering faith, she would go down in history as Saint Joan of Arc. About Nancy Wilson Ross (Author) : Nancy Wilson Ross is a published author of children's books. Some of the published credits of Nancy Wilson Ross include Joan of Arc (Landmark Books).